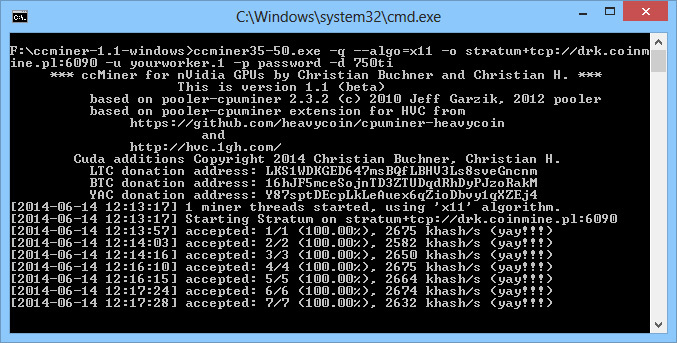 The ccMiner Nvidia CUDA miner has just been updated to version 1.2 with the source code getting support for the community contributed X13 and Diamond Groestl support. We have compiled a windows binary version from the source that includes the recently released optimizations called “Killer Groestl” that improves the performance of Groestl and all coins that use the algorithm supported by ccMiner. If you are using tsiv’s fork of ccMiner for mining X13 then it is recommended to download this new update as it will bring an extra performance improvement in x13 mining hashrate. Our tests show that on a GeForce GTX 750 Ti you can expect to get from about 1700 KHS to close to 2100 KHS mining X13 with the new ccMiner 1.2 as X13 does rely on Groestl as well.